I find it hard to avoid going overboard when food shopping in Paris - I just want to buy everything! Jams, salted caramel sauce, biscuits, sugar, chocolates and more! 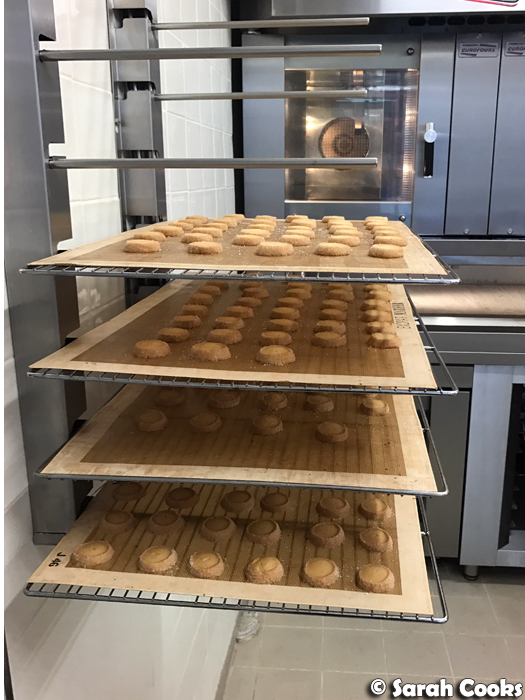 Then of course, there's the test to see how long I can make the sweet treats last once I'm back in Germany (and then Australia) - it's a fine balance between overindulging all at once, savouring them, and making sure they all get eaten before they're past their prime. I'm ashamed to say that in the past I've overbought and then had things go to waste. But, with much practice, I've gotten better at only buying reasonable amounts of things that I know I'll actually eat. 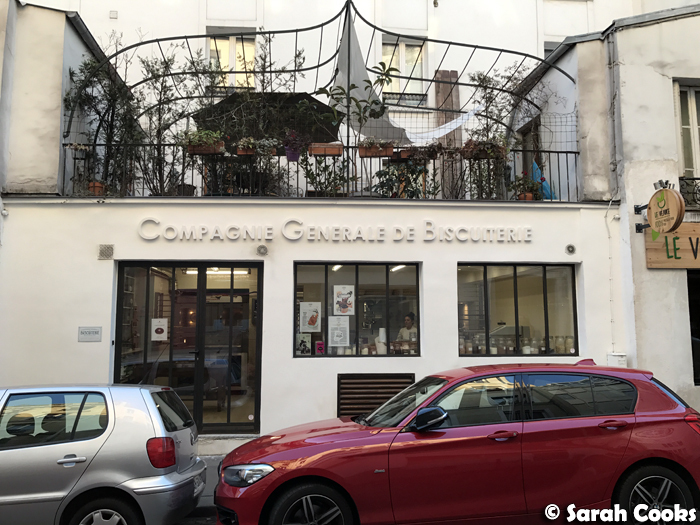 As you know, my first shop stop was the Compagnie Générale de Biscuiterie, which I'd read about on David Lebovitz' blog and couldn't wait to visit. It's such a great little shop! It was very plain on the inside - it's primarily a working bakery, with a table at the front displaying their biscuits for sale. It's all about the biscuits! (Note to self: potential autobiography title). 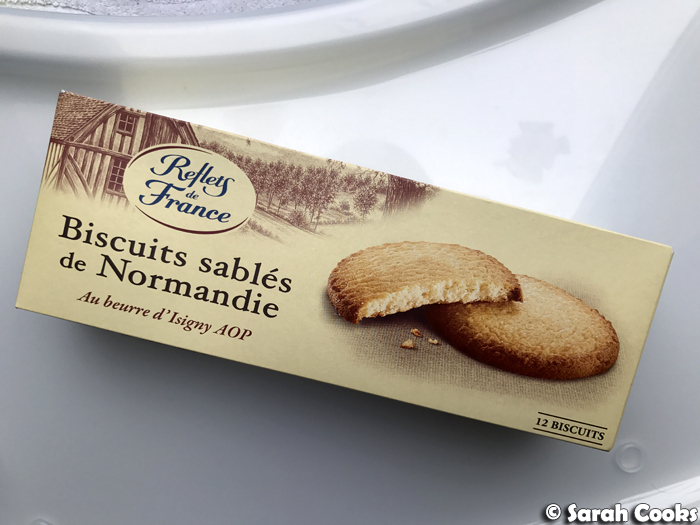 The salesperson at the store was extremely nice, patiently explaining to me the different biscuit varieties, while I asked him questions in broken French and tried not to stick my hands in the display of biscuits. I also asked him if I could snap a few pics, and he was more than happy to let me do so. Hooray! Here's my stash, which I ate about a week after purchase. 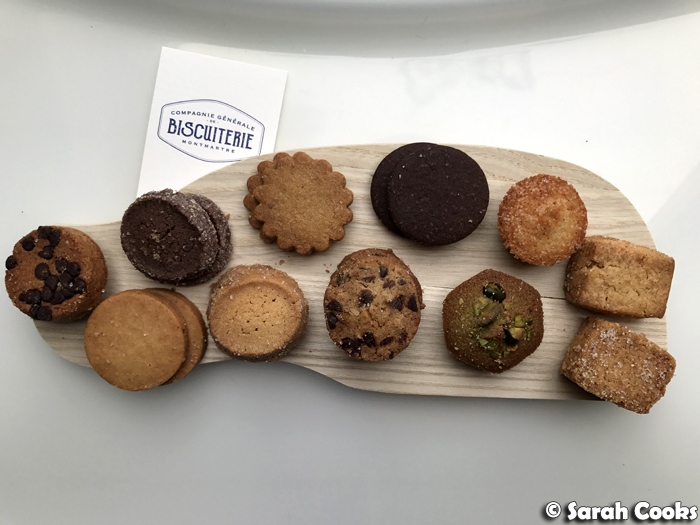 The biscuits cost 6.50€ per 100 grams, and I bought 10€ worth of biscuits in a small bag, so I could try most of the flavours. (They seal the bag for you so it stays airtight). After the first bite, I kicked myself for not splashing out on the big 30€ tin! Next time, next time. Y'all know I'm a biscuit fiend, and each little bite of crisp buttery deliciousness was was a delight. 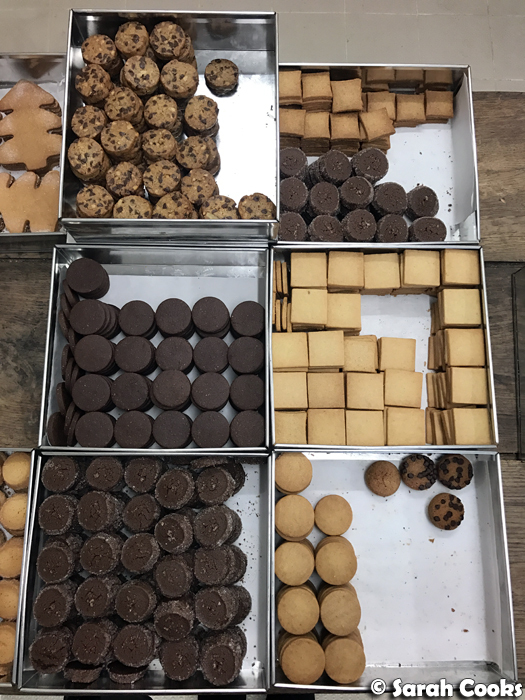 They were all fantastic, but my favourites were the vanilla kipferl Alsacienne (furthest right in the above photo, strangely made in a square rather than a crescent), and the thicker chocolate / vanilla shortbreads with sugar pressed around the edges. (The hint of salt in these really made them pop). Love! Next stop was Lafayette Gourmet. On this trip, due to the timings, I had to do my Lafayette Gourmet Sweep (can I copyright that?) at the start of the trip, rather than at the end. This meant that I had to skip my usual L'Éclair de Genie and the Cinco Jotas counter, as they simply wouldn't have kept. However, as a reminder for future Sarah: L'Éclair de Genie's eclairs are delicious, especially the salted butter caramel and the raspberry passionfruit. Also, the iberico ham ciabatta from the Cinco Jotas counter is like your favourite thing to eat in the entire world, and it is absolutely worth splashing out on the most expensive one (12€). 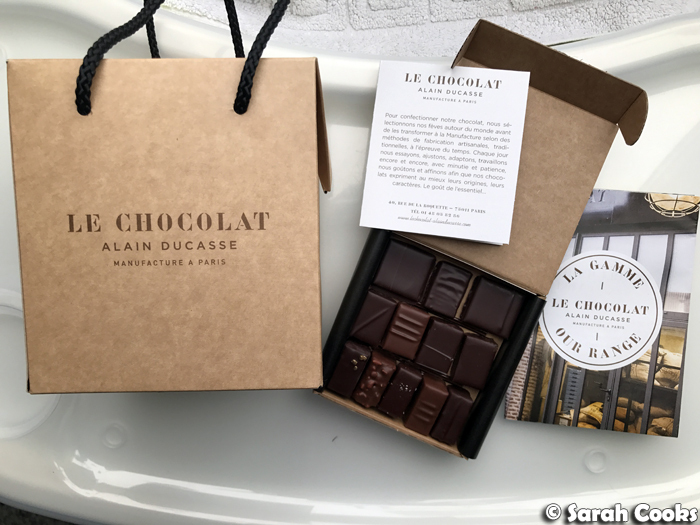 What I did get from Lafayette Gourmet were Pierre Hermé macarons, and gorgeous chocolate pralines from Le Chocolat Alain Ducasse. For me, Pierre Hermé macarons are a must. Mogador (chocolate passionfruit) is the ultimate flavour, and the remainder were, from memory, different types of chocolate ones (the one on the front right was definitely Infiniment Chocolat Paineiras - a single origin Brazilian, and I'm fairly certain the one on the front left was Infiniment Chocolat Bélize). Either way, all delicious. 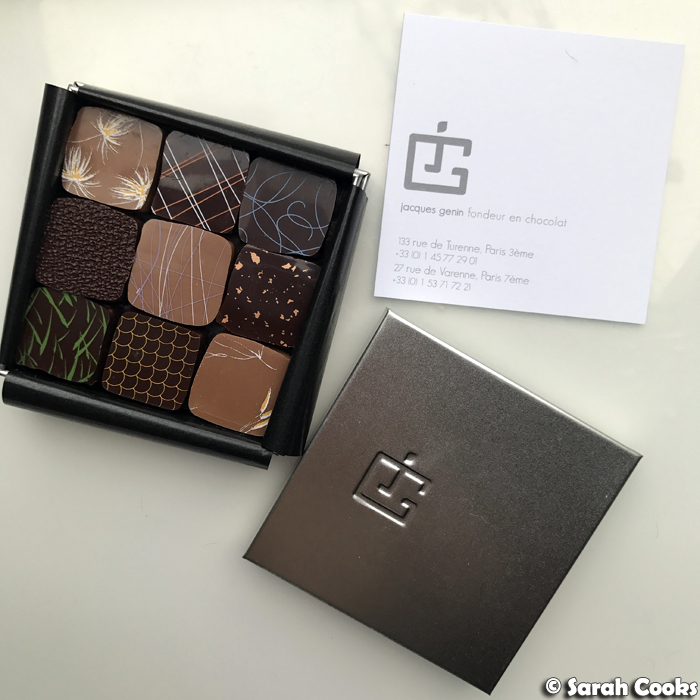 I hadn't visited Le Chocolat Alain Ducasse previously, but my good friend Duncan highly recommended their pralinés! 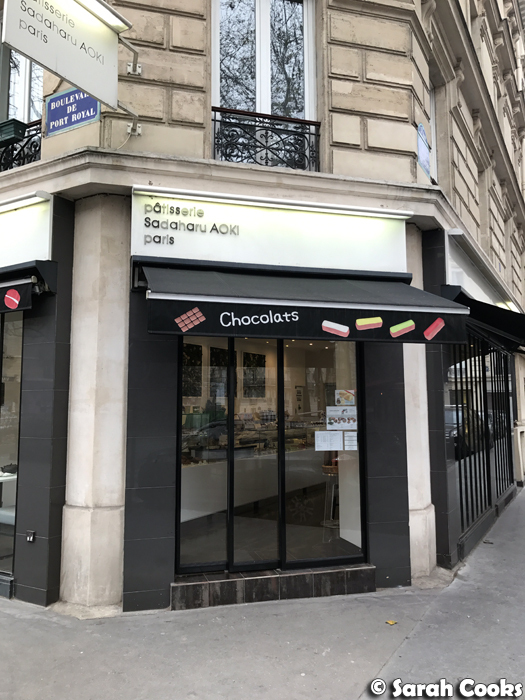 Le Chocolat is a bean-to-bar operation by famed chef Alain Ducasse, and I believe is currently the only chocolatier in Paris who makes their chocolates from scratch - right from sourcing the beans, to roasting them, conching, melting, dipping, enrobing and so on. 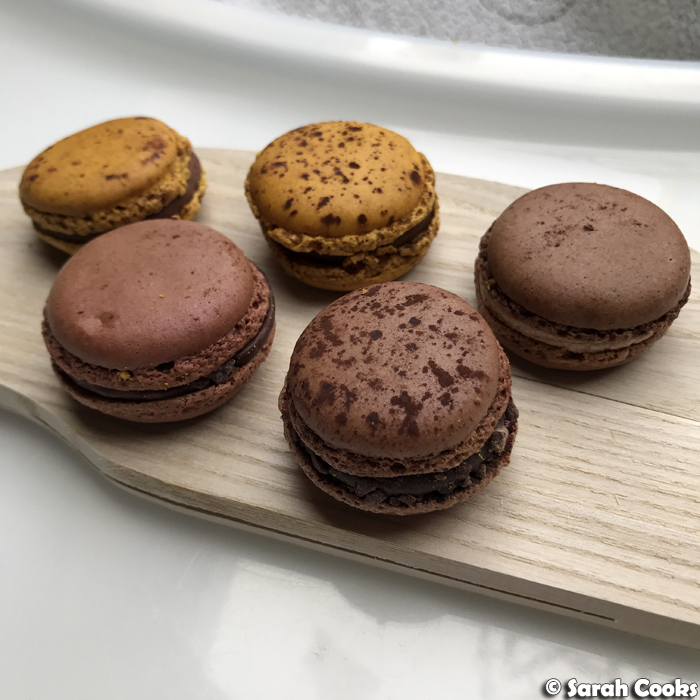 (Read David Lebovitz' blog for a wonderful insight into the chocolate workshop). The love and care that goes into making these chocolates does mean that they're quite expensive - it was 18€ for that box of twelve. Such precious cargo! 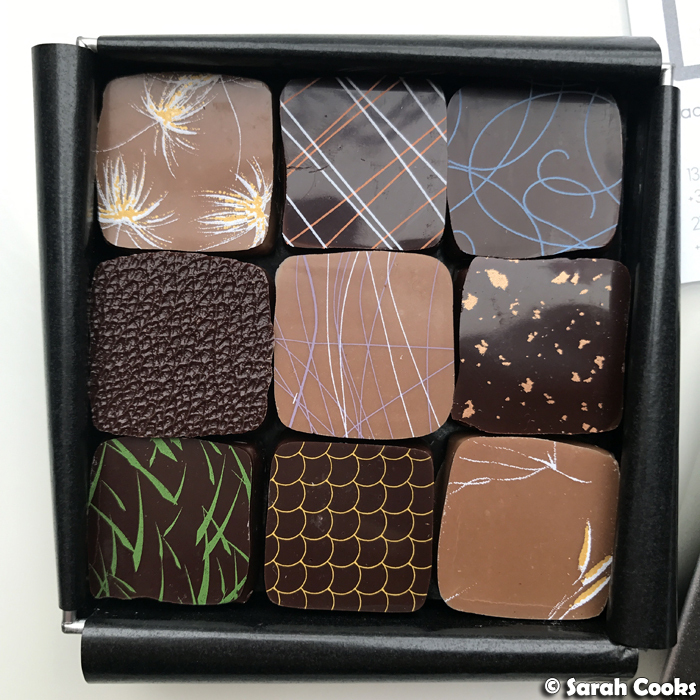 The top row are single origin ganache; the centre row are flavoured ganaches, and the bottom row are old-fashioned pralines (pralinés à l'ancienne). The box does come with a little tasting card to explain the flavours, but the pictures are highly stylised and confusing, and we couldn't figure out which flavour is which as we ate them. Little did I know the website has a super easy photographic key. Whoops! I won't describe every single one, but let me tell you that the pralinés à l'ancienne were my favourite - with really intense roasty dark flavours. These are very grown up chocolates, definitely to be savoured slowly. In addition to the pralinés and ganaches, they have chocolate blocks, dragées, candied fruit, and a very decadent-looking pâte à tartiner (chocolate spread) that I really want to try next time! (I bet it would be fabulous spread on crusty baguette). Moving on from Lafayette Gourmet! Another famous chocolatier is Jacques Genin. You may remember my previous visit to their salon de thé, where I enjoyed an incredible chocolat chaud and a mille feuille). 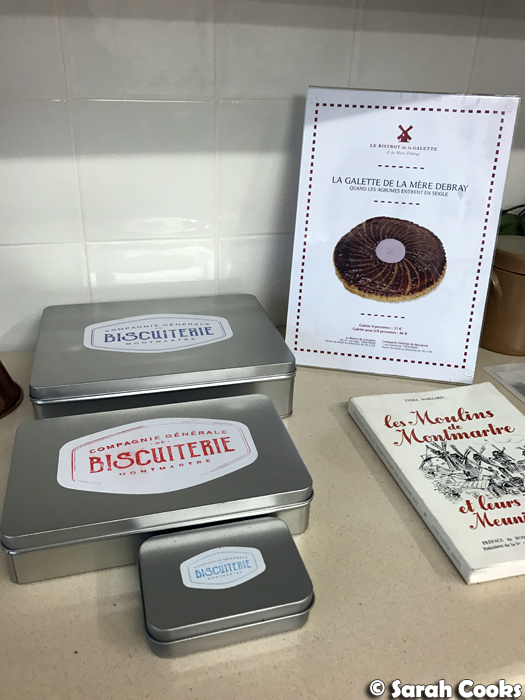 I didn't have time to pop into the shop this time, but when Clarice went to pick up that Paris Brest, she kindly picked up une petite boite des chocolats on my behalf. For me, the mint is the highlight (so minty! ), but you really can't go wrong. They have a wide range of flavours, from plain to exotic - buckwheat honey, Sichuan peppercorn, vanilla, almond, coriander and more. I've always been really impressed by the purity and clarity of the flavours in these pralines. I've heard that the Patrick Roger chocolaterie is very good, so I'm putting that on the list for next time. 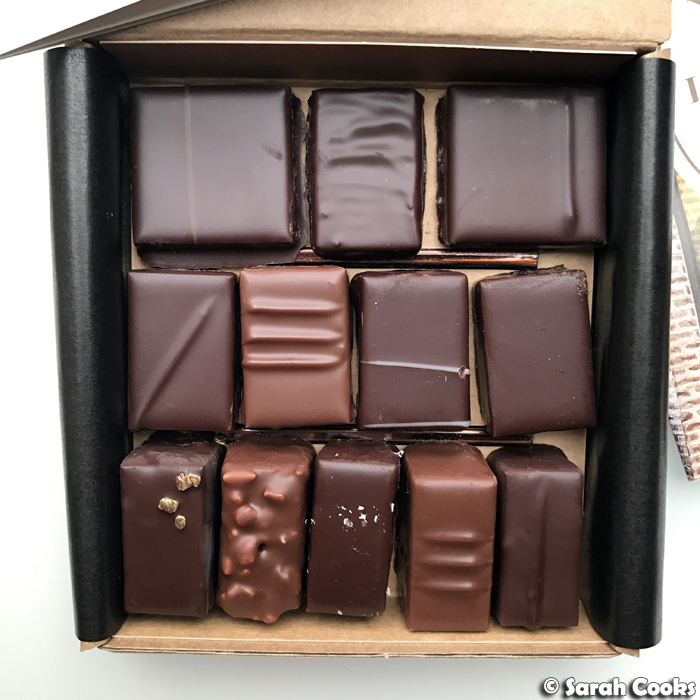 I've also previously bought treats from Jean-Paul Hevin (they've got a counter in Lafayette Gourmet) and particularly enjoyed their palets fins ronds (thin chocolate rounds). And actually, I still have the same Jean-Paul Hevin insulated bag I bought back in 2011 - I carry my lunch in it! Moving on from the chocolats! 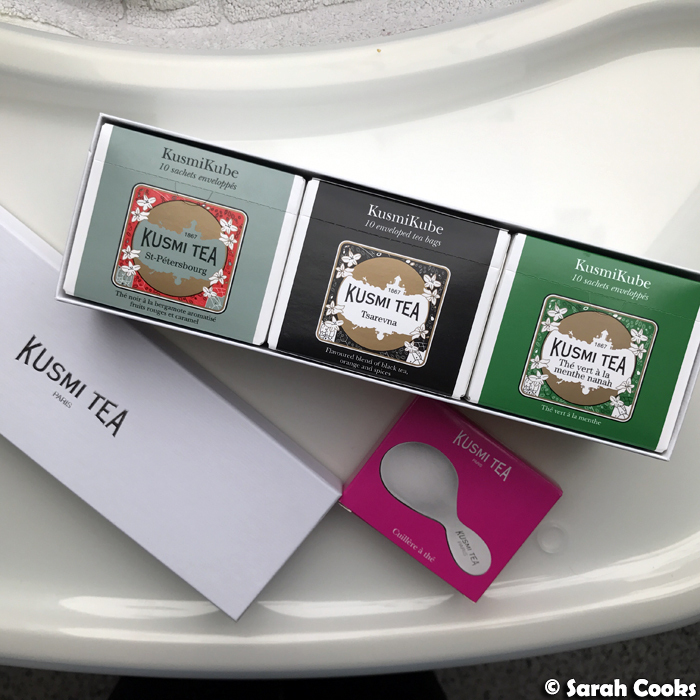 Clarice's mum generously gave me some pretty Kusmi Tea as a surprise Christmas gift, and a super cute tea spoon. I loved it! 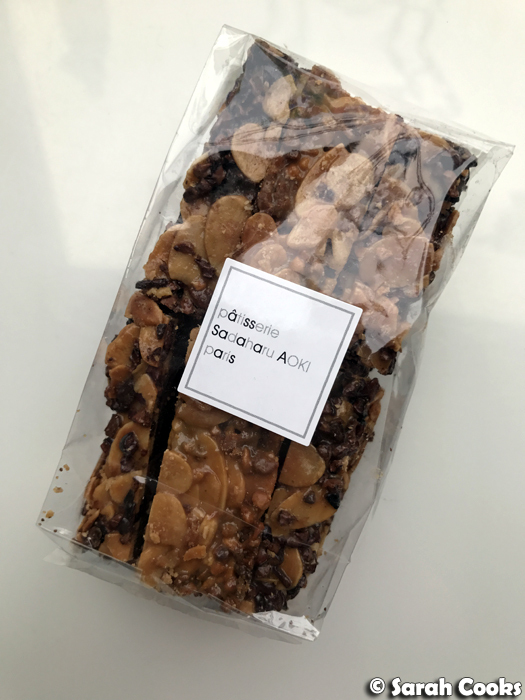 When we had breakfast at Sadaharu Aoki, I impulse-bought a little bag of florentines. 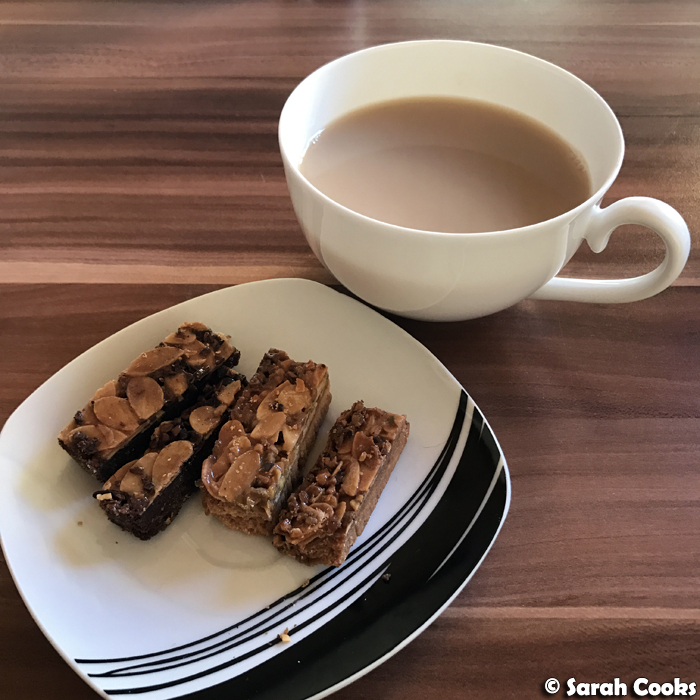 I saw the biscuit base and the crisp caramelised almond topping and couldn't resist! I'm really glad I bought these, because they were amazing. Half had a chocolate base, and half were vanilla. Both were great, but for me the vanilla was the better flavour. I loved the buttery flavour against the crunchy almonds. Would definitely buy again. 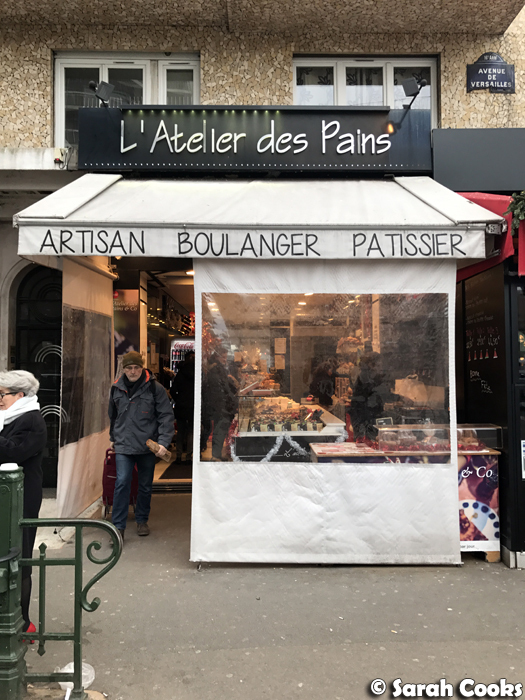 On my way back to the station from Clarice's place, I stopped in at a local boulangerie (a branch of L'Atelier des Pains) to get some pastries for the train ride home. 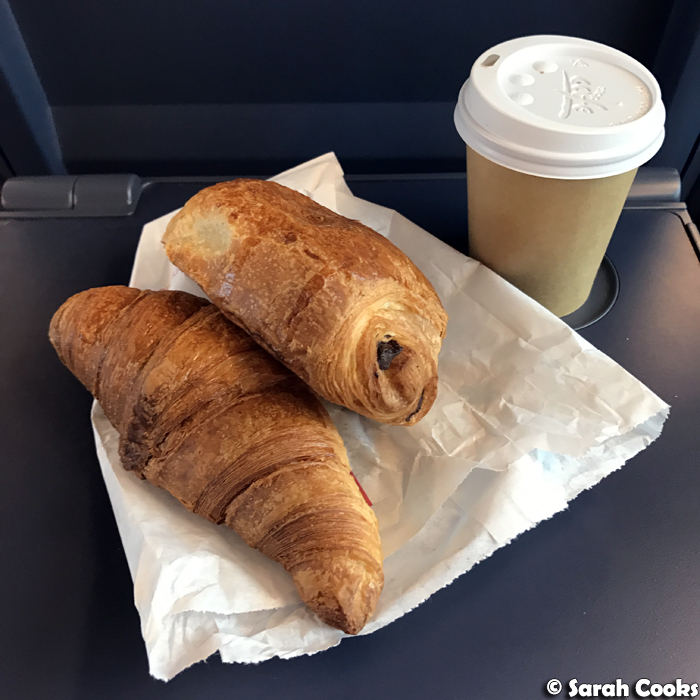 Eating these, it struck me that I rarely have regular croissants or pains au chocolat from local bakeries when in Paris, (the last time I did was 3 trips ago) as I'm always on the lookout for something extra special or unusual, or searching for something specific that I've read about. Note to self: stop being so precious and just eat the damn croissants. They're all good! 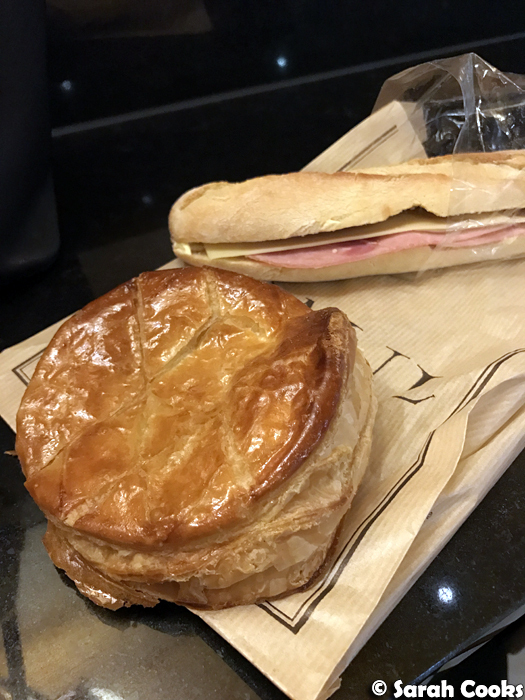 And speaking of which, because I was visiting just before New Year's, all the bakeries were selling Galettes Des Rois, cakes of puff pastry with almond cream filling, to celebrate the Epiphany on January 6. Clarice insisted that I try one, because they're delicious and even though lots of the high-end bakeries do fancy versions, she said that any regular old patisserie would make them just fine. ("You can even get them from the Gare de l'Est from a regular bakery- its's hard to go wrong"). Well, I did just that, picking up an individual galette at ubiquitous patisserie chain, Paul. (You can also see my lunch, a perfectly fine but not very exciting baguette jambon fromage, in the background). 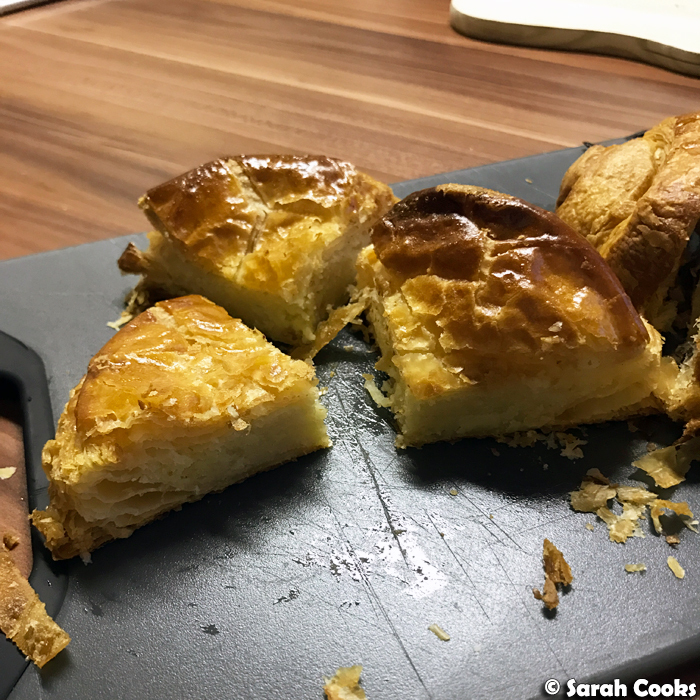 I had thought of getting a full-sized Galette des Rois to share with the family back home in Germany, but decided against it in the end, as they've never seemed to like French desserts, finding them too sweet, or (in the case of chocolate), too dark. Well, I was wrong, because Sandra's mum actually really liked it! She even took a second piece - woohoo. (Hot tip: heat the galette in the oven for 10 minutes to get it warm and crisp, even more delicious). Eating this reminded me that a Pithiviers (which I believe is the name given to this cake when not eaten on the Epiphany) has been on my "must bake" list for at least 20 years, ever since I read the recipe in The Roux Brothers on Patisserie. Perhaps for next Epiphany! And those were the sweet treats I bought in Paris! Do you like to food shop when you're on holiday? Do you have a favourite place in Paris that I've missed? Hit me up in the comments! I never been in Paris, but I love french meals.